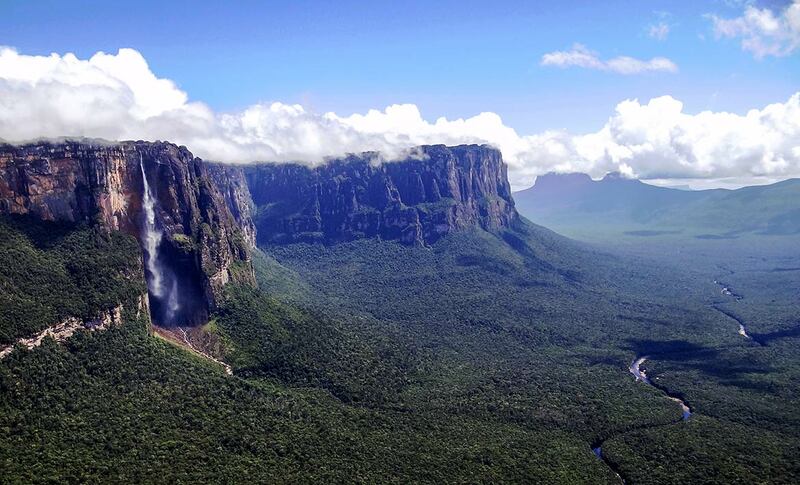 Morning view of Kukenán (left) and Roraima table mounts (tepui) in the Guayana Region of Venezuela. A virtual guide to Venezuela, officially, the Bolivarian Republic of Venezuela, a country in northern South America that borders the Caribbean Sea in north and the North Atlantic Ocean in east. With an area of 912,000 km² Venezuela is slightly more than 2.5 times the size of Germany or slightly more than twice the size of the U.S. state of California. Venezuela has a population of 31.1 million inhabitants (in 2015) of whom 6 million live in the capital and largest city Caracas. 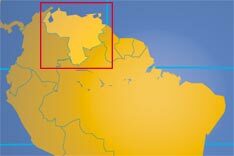 The country's population is concentrated along the Caribbean coast, only 5% of all Venezuelans live south of the course of Orinoco river. Official language is Spanish. Venezuela was one of the three countries that emerged from the collapse of Gran Colombia in 1830 (the others being Colombia and Ecuador). Under Hugo CHAVEZ, president from 1999 to 2013, and his hand-picked successor, President Nicolas MADURO, the executive branch has exercised increasingly authoritarian control over other branches of government. At the same time, democratic institutions have deteriorated, threats to freedom of expression have increased, and political polarization has grown. Current concerns include: an increasingly politicized military, rampant violent crime, high inflation, and widespread shortages of basic consumer goods, medicine, and medical supplies, overdependence on the petroleum industry with its price fluctuations, and irresponsible mining operations that are endangering the rain forest and indigenous peoples. Venezuela assumed a nonpermanent seat on the UN Security Council for the 2015-16 term. Location: Northern South America, bordering the Caribbean Sea and the North Atlantic Ocean. Natural resources: Petroleum, natural gas, iron ore, gold, bauxite, other minerals, hydropower, diamonds. Agriculture products: Corn, sorghum, sugarcane, rice, bananas, vegetables, coffee; beef, pork, milk, eggs; fish. Industries: Petroleum, iron ore mining, construction materials, food processing, textiles, steel, aluminum, motor vehicle assembly. Venezuela is a federal republic; chief of state and head of government is the president. The president is elected directly by simple majority popular vote for a 6-year term and no term limits. 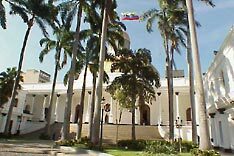 Venezuela's legislative branch is a unicameral National Assembly (Asamblea Nacional), its members serve 5-year terms. The National Assembly of Venezuela. Venezuela's representation to the United Nations. Embajada de Venezuela en Washington. Address list of Venezuela's Diplomatic Missions Abroad. Searchable map and satellite view of Venezuela. Searchable map and satellite view of Venezuela's capital. Reference map of South America. 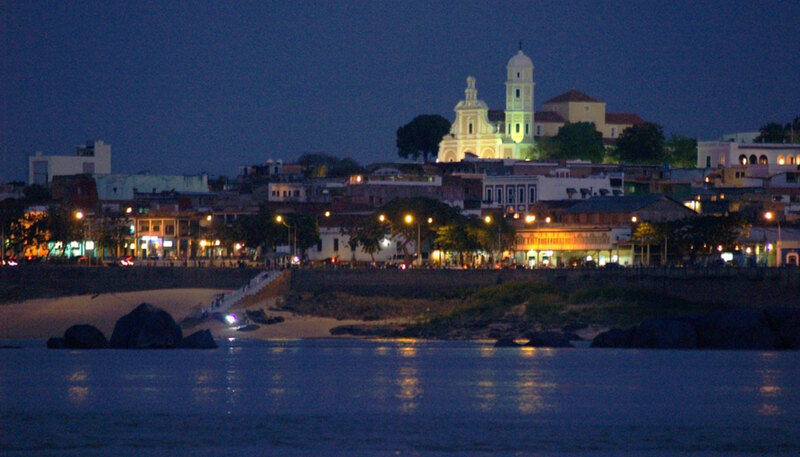 Ciudad Bolívar, the capital of Venezuela's southeastern Bolívar State. The government has been accused of creating an intimidatory climate for journalists, while some private media have been accused of being involved in the opposition movement against president Nicolas Maduro. RSF states: [President] Nicolás Maduro, does his utmost to silence independent media outlets. The climate for journalists has been extremely tense since the onset of a political and economic crisis in 2016, and is exacerbated by Maduro’s frequent references to the “media war” being waged by national and international media outlets to discredit his administration. Business newspaper based in Caracas. Venezuelan Newspaper and one of the most widely read and circulated daily. Venezuelan news and infos, a major national newspaper. New York Times article about democracy’s implosion in the country. The National Library of Venezuela (in Spanish). Caracas contemporary art museum. After a painting by Matisse was recovered in Florida in 2012, the museum is under investigation, and its website gone silent. The Central Bank of Venezuela. Low-cost airline based in Maracaibo. Aerovias Venezolanas, S.A . went into bankruptcy due to poor management in 2002. Venezuela's flag carrier between 1960 and 1997, ceased operations in January 1997. Churún Canyon, also known as Devil's Canyon (Cañon del Diablo) in the Canaima National Park with Angel Falls, the world's highest uninterrupted waterfall with a plunge of 807 m.
tourist boards, attractions, festivals, events, accommodation, hotels, biking, hiking, trekking, climbing, diving, tours and much more. Virtual Venezuela - in Spanish. Web Turístico de Margarita - provides information on the islands Margarita, Cubagua and Coche. Highest ranking public university of Venezuela, located in Caracas (in Spanish). As a study center founded in 1785, 1810 transformed into a university, the second-oldest university in Venezuela has its main campus in the city of Mérida. Private university in Caracas, founded in 1954. Scientific and technological public university, founded in 1968 (Spanish). Ministry of the environment and renewable natural resources (in Spanish). Wikipedia article about Venezuela's history, part of a series on the History of Venezuela. Comprehensive information about Venezuela's history.